We live in a charming 3/4-bedroomed detached house in Saint-Gély-du-Fesc, which is a small town about 5 miles away from Montpellier. We've got a beautiful garden with a swimming-pool, a barbecue, 10 comfortable chairs, 2 tables and 3 deckchairs, a palm-tree, an olive-tree, lovely rose-trees, etc. Everything you need to enjoy a sunny summer out! Downstairs, there are two bedrooms : one with a king-size bed, one with a cot, but we've got 2 extra fold-away beds (ideal for young kids). There is also a bathroom with a shower-cabin + a bathtub. Upstairs, there are two more rooms, each with its own sofa-bed. And there is a tiny bathroom too, with toilets and a shower-cabin. As we bought the house last year, the upstairs zone is not as comfy as the rest of the house, but it's not an attic either, so don't worry! We can accommodate up to 8 people but would prefer a family of 3-5 people, or a couple. Besides, we've got everything a baby needs : cot, high chair, kid pen, baby chair, changing table/mat, etc. And if you feel sporty, you can also use our elliptical bike and our Wii Fit games. As we only moved in last summer, we don't know the neighbours quite well yet. But the neighbourhood is clean and quiet. Saint Gély is a nice place to live. There is a market every Saturday morning, there are a few shops + a supermarket within walking distance. 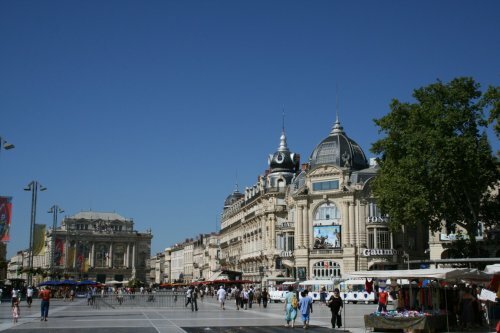 There are also a couple of restaurants, but if you really want to enjoy your time out, you'd better go to Montpellier, where you will find everything : restaurants, cinemas, theatres, opera, concert halls, places to visit, etc. We'll be leaving our cars at your disposal. We've got two Peugeot 206, one is automatic and the other is standard. So you'll be able to choose whichever suits you best. And if you don't feel like driving on the right hand-side, there is a bus-stop nearby, and the bus will take you to Montpellier within 10-15 minutes. We are a family of three. Fabrice and I have been married for nearly 4 years, we're both teachers, and our son Antoine will turn 1 year old next September, so he's still a tiny little baby. We've also got a 2-year-old cat whose name is Bouboule. He is self-sufficient (there are catdoors and he goes in and out as he wishes) so he will just need to be fed and "watered" during your stay.